United Nations, 21 August 2014 - Dr. David Nabarro talks about the recent outbreak of Ebola virus disease in West Africa. He explains the origin of the virus and how it could be prevented. He also describes the role of the World Health Organization in the region to help those affected and prevent the spread of the disease. See an interesting video at CNN, with possible scenarios for Ebola related to an index case traveller, and procedures in place by USA. 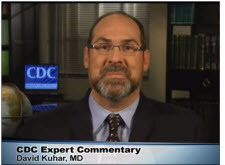 Dr. David Kuhar, a medical officer at the Centers for Disease Control and Prevention (CDC). I'm pleased to be speaking with you today as part of the CDC Expert Video Commentary series on Medscape. Today I want to discuss what healthcare facilities can do to prepare for a patient with Ebolavirus disease and the infection control procedures that need to be in place in US hospitals. The recent Ebola virus disease outbreak in West Africa has increased the possibility of patients traveling from the affected countries to the United States. Furthermore, 2 American citizens with Ebola were medically evacuated to the United States to receive care at a hospital. Any US hospital that is following CDC's infection control recommendations, and can isolate a patient in a private room,‎ is capable of safely managing a patient with Ebola virus disease.